PhD Nutrition is one of the big players in UK sports nutrition and supplements. But some people may not be familiar with PhD Woman — a branch of PhD launched with a range of products aimed at the female side of the general fitness market. PhD Woman is a decent source of content, be it recipes that fit your macros, full meal plans or workout programmes. It’s run by women in fitness with the aim of encouraging more women to get into fitness. A strong core value is encouraging: if the manufacturer has put this much thought into their mission, the more likely this will carry through. The supplements across the range also contain no artificial ingredients. However, most of the content on the PhD Woman Academy part of the website hasn’t been updated since July 2016, plus the available products seem to have shrunk to only a handful and most have seen mixed reviews on both PhD and Amazon. This puts a dampener on my initial enthusiasm. Let’s see how PhD Woman Natural Protein looks under the lens. A complete source of protein, meaning it contains all 9 essential amino acids, brown rice protein is a source of quality protein for those who are omitting dairy from their diet. PhD don’t list the type of processing the brown rice has undergone, so its safer to assume it’s a brown rice protein concentrate rather than an isolate. Brown rice protein has a quick absorption rate, only 6% slower than whey protein, and research has shown identical benefits for muscle growth and strength at both higher and lower doses when compared to whey protein. 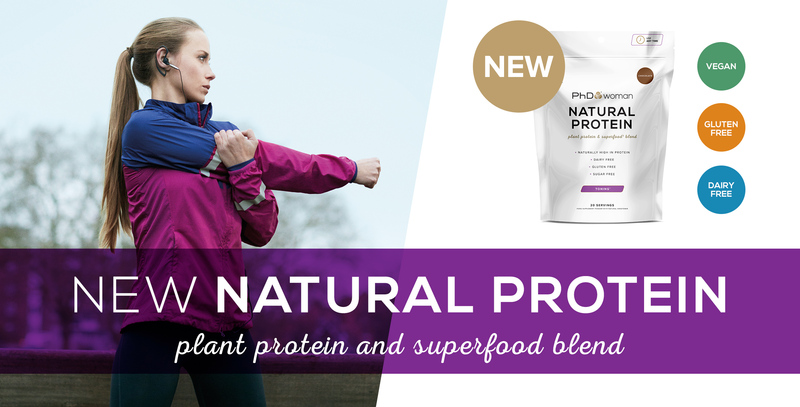 PhD Woman Natural Protein uses pea protein isolate, another quality source of plant protein that comes with a full amino acid profile. Research has shown no difference on muscle protein synthesis between using whey and pea protein to supplement resistance training. Pea protein is slower absorbing than brown rice protein, so combining slow pea and fast brown rice protein creates an intelligent blend for a recovery shake. Similar to the two-pronged approach with whey and micellar casein. Pea protein isolate typically achieves around 85% protein content and would be diluted by the lower content of the brown rice protein concentrate. But to explain the 71% protein: it’s most likely due to the other ingredients diluting the protein. PhD Woman delivers 20g per 30g serving in their Natural Protein, which isn’t ideal. Growing in popularity as a quick way to get nutrient dense carbs into your diet, sweet potato powder has a low GI (slightly higher than its fresh form) for sustained carbs throughout the day. Effectively dried, concentrated sweet potato, it’s high in vitamins B, C and A. Including it in the shake is probably to boost the carbs to 6.32g per portion than the nutritional benefits of sweet potato, but the weight of sweet potato isn’t included. Also included as a whole food, pumpkin is high in vitamin A, and phytosterols which can reduce cholesterol and have been linked with reduced risks of gastrointestinal forms of cancer. However, for the effects on cholesterol, doses are above 1.6 grams of plant sterols per day. PhD don’t list the weight of the pumpkin powder, let alone the content of phytosterols. The four catechin molecules found in green tea and consumed by steeping the leaves in water and drinking are our active ingredients. In PhD Woman Natural Protein, these catechins are included as a green tea extract, a supplement that has become increasingly popular. Catechins have been seen to protect the cardiovascular and nervous systems, reduce fat and risk of cancer, and increase insulin sensitivity and cognition. It’s a highly studied and proven ingredient. In many sports supplements it is included for its fat burning attributes. However, these benefits are only seen at high doses of over 600mg per day. There’s no arguing it’s a great ingredient for general health at lower doses (around 50mg catechins per cup) … but we won’t know if this applies to PhD Woman Natural Protein as no dose is indicated. Thaumatin is actually a protein and it’s so sweet that when used as a sweetener its calories are immeasurably small; it’s able to produce a sweet taste in humans at only 50 nano mols (a very, very tiny amount). Found in the Katemfe fruit in West Africa it has been approved as safe for human consumption across the board. Many reviews emphasise how overly sweet this protein powder is. This could be down to the amount of thaumatin’s intense sweetness and its tendency to linger into a liquorice-like taste on the tongue. You probably remember when goji berry was a superfood hit, but lack of scientific evidence has seen it deflate. It has shown evidence of reducing blood sugar in people with diabetes as well as improving quality of sleep, general wellbeing and cognitive function. But all benefits require more research. The compound known as raspberry ketone that is not only responsible for the aromas and flavours in raspberries, but in higher doses (estimated at 80-340mg/kg for humans) it might induce fat burning. It’s important to note that all evidence for raspberry ketones is in test tubes, and these concentrations cannot be replicated in the human body. High in phycocyanobilin, spirulina is a powerful anti-oxidant and anti-inflammatory ingredient. It has also been seen to reduce LDL cholesterol and increase HDL cholesterol and improved muscular endurance. Proponents for wheatgrass have a lot of claims. It is a powerful anti-oxidant, which for a fitness supplement is always good, but there is no evidence to support its anti-cancer properties. PhD Woman Natural Protein is completely vegan. The protein blend is well executed and effective for recovery. 71% protein content is competitive for dairy free powders. 71% protein is on the low end compared with a typical whey protein. No listed doses or weights for its advertised “superfood blend”. The greens and berries blend within PhD Woman Natural Protein doesn’t really bring anything to the table. There are a large proportion of negative reviews, mostly complaining about the powder’s poor mixing quality and warning that a blender is needed. Other reviews state the taste is not appealing, or too sweet. All the listed ingredients are safe to consume at the directed doses unless you have any allergies. As with most refined protein powders, pea and rice protein may also cause some gastrointestinal discomfort such as nausea and bloating. Throw one 30g scoop of PhD Woman Natural Protein into a shaker or blender with 250ml of water and shake/blend for 5-10 seconds. PhD Woman state to only consume up to two servings per day. Which caps you at 40g of protein from this shake per day. This protein is aimed at the dairy alternative segment of PhD Woman’s market, such as women looking to reduce dairy consumption and boost protein intake. Whether it’s as a recovery shake or as an ingredient in one of their high-protein vegan recipes. The verdict on PhD Woman Natural Protein? It’s a little inconclusive. The plant protein blend is good, and some thought has gone into designing it to best suit sustained recovery, although the protein content isn’t as high as its competitors. 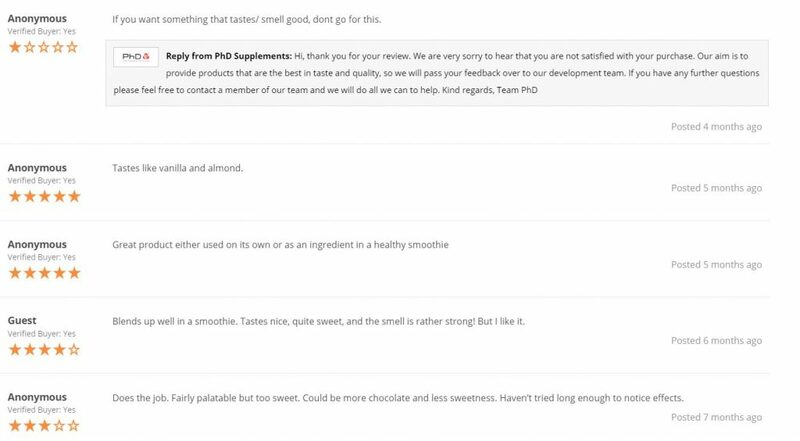 PhD Woman has tried to create a tasty vegan protein shake, but it only takes a glance at reviews to see that this is subjective at best. The superfoods and whole foods boost the nutritional value of the product, but it’s not possible to say by how much with a lack of details and doses. Under scrutiny, the values of PhD Woman that seemed strong on the outset come out the other side looking a little flimsy. I can’t help but get the impression that PhD Woman has been left in PhD’s periphery. 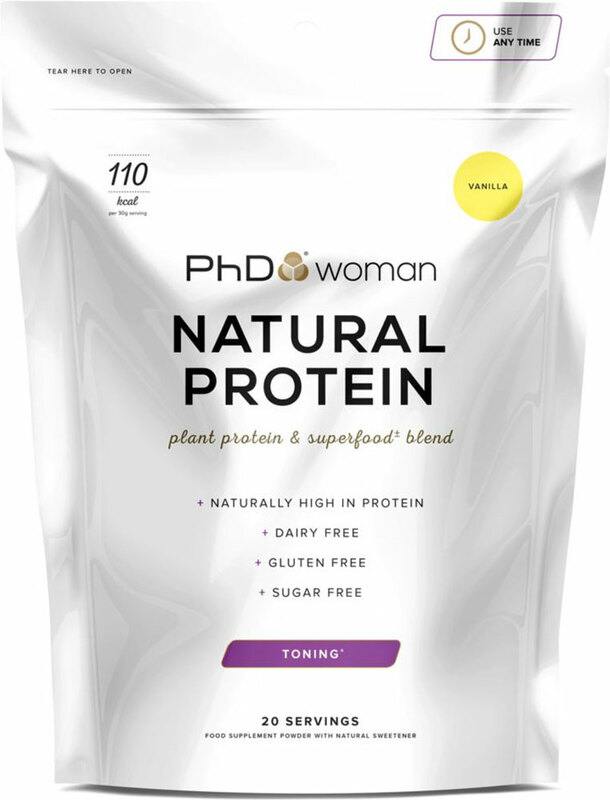 But hey, at the mid-range price and from a trusted brand… give PhD Woman Natural Protein a try, but there are better vegan options out there. With a long personal background in health and writing, combining the two was almost inevitable. After working in leisure centres on the frontline of fitness, I won an international prize for fiction in 2015. I returned to university where I dove into the theory of fitness and nutrition alongside my studies, completed a master’s degree in creative writing and became a full-time writer. I now write well-researched, accessible health, fitness and nutrition content. Some of the markets I’ve written in include: self-help psychology; intermittent fasting; keto; health and performance supplements, and health/beauty eCommerce.